« 253 - Gardening Enjoyment - or not. A poorly written article in the Guardian this week prompts me to respond, but in this medium. I opine that this is the correct medium for doing that; I can vent to all and sundry while no-one necessarily is forced to have anything to do with the content. Mind, I think what I write is worth reading, but I am aware that in conversation one has some clues when to stop. • The urgency, of the message or its reply or both. To an extent, how you use the phone is affected by how communicators with you prefer to behave. Surely a good deal of your phone activity is governed by the behaviour of others. We have a convention that the initiator of a communication defines the medium, though I am well aware that while I will initiate a communication by email, many businesses want to make a phone response. Indeed, in my view far too many people want to use a phone. There’s a whole essay already written about that, some of which I’ll repeat later. You probably carry your phone because it is also a multi-purpose gadget of surprisingly little size and weight. The phone function is one of many. You are available to be called in one medium and you can initiate calls in a choice of medium, possibly limited by access to signal at the moment. People who prefer the phone are accused by me of preferring it because you look busy. But you aren’t. If you want the meandering conversation that take ages and go nowhere, then replace the phone with Skype. Skype has the huge advantage of costing very little, adding video and working just as well internationally as locally. You have many choices: phone, voicemail, Skype (Wichat, Facetime, etc), text (and its many messaging versions), email. Plus others, like face-to-face talking or written letters, now called snail mail. Do you actually consider this a choice or do you simply opt for one by habit? What is the other person’s position? Mostly I’ll prefer to email, becasue I don’t want to drag someone away from something productive. The particular exception is where I’m calling someone who works on the phone (service providers mainly). The questions I have (that’s the reason for calling) are usually complicated, requiring the other party to stop and think; the more I need to explain position, the more I think the written word is important. Also, email leaves a record of what my position was at the time. Which a phone call signally fails to do; this makes it a preference for some parties. We build up habits to do with communication. I have only rarely had those rambling chats characteristic of teenagers, and I didn’t do it at that age. That is, I do have rambling chats, but they are face to face (Skype included). That seems appropriate choice of medium to me. I like email for several reasons; it allows me to choose when I do such a thing, it allows for context to be included, for background to be referenced, for the history of the conversation to be included; to me, a thoroughly helpful medium. Email is appropriate for text-length messages only when texting is difficult for any reason (not having the number, mostly). Ditto text, when one has phone number but not email address. I do not subscribe to data roaming, with the consequences accepted. The length of my question may determine choice; texts are usually short, emails are usually longest. My emails are inevitably long, which is a failing I recognise, but for me it indicates the amount of time—and therefor thought—I have put into the message. The urgency of the message frequently defines the choice of medium and the perception is that the phone will be the quickest route to contact. This is not necessarily so, but you establish if the people you’re calling are immediately available. At the failure point I say you should make another choice, including reconsidering the immediate position.1 If you’re calling me, then my phone is usually not to hand; all you do is cause the thing to perhaps make noise and record that you called. If you call my landline, it takes so long to get to the phone most people have given up by the time I get there. Actually, in our case, the landline is only called by machines trying to esablish a connection and play some message we do not want to hear. So, still falling for the idiot reaction to go respond to the phone, one picks up but says nothing; the 'bot then breaks off, because it ‘thinks’ machine has called machine (patently untrue). We have not yet had a call we want to receive: the correct question is why do we have it at all. The other party has a different set of preferences and choices to you. You may or may not take these into account. I completely accept that sometimes the choice of medium is determined by circumstance, such as being in the street (either or both of you). 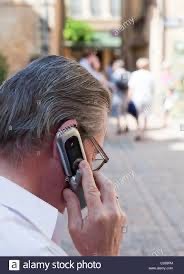 My observation of people apparently trying to prevent their ears falling off while walking around town indicates to me an entirely different habit, which is a declaration that walking is talking time, that all street time is opportunity to chat, so eventually the habit is grown that means that stepping onto the pavement triggers the habit to open the phone and call someone. Someone, anyone, just serve the desperate need to chat. That, to me, indicates a vacuity of purpose and falls into the trap of which I complained at length in Essay 30, that calling someone because you’re bored (essentially, that is the problem) might fix your problem but it makes assumptions that the other party has also time to waste. No wonder Britain is famously bad at productivity. ². So my reason for disliking the phone has moved on from Essay 30. I still don’t want to be bothered, I don’t like being interrupted and I don’t want my time wasted, so a personal call is assumed urgent, meaning immediately time-dependent. Indeed, I can class most of all calls labelled ‘useful’ as being to do with appointments; I agree these can need discussion, have variability that meets the criteria for conversation, and that the circumstances change. So I do want a call that tells me that the meeting I’m going to is cancelled, and I do want to hear about anything requiring immediate response. But that does not mean I will necessarily have my phone to hand at all times. I often forget it (but I forget it, not deliberately leave it behind). If the call is not urgent, I’d prefer text; the advantage of the phone over text is that it interrupts, so this is a decision you took in preferring to call – and if your call is not urgent, I’ll challenge your decision explicitly (or implicitly, by being even less polite than usual). Looking for an image to put at the top, I found wikipedia had some worthwhile content. Enter media richness theory, MRT, which is a communication medium’s ability to reproduce the information sent over it. The critical matter is when you need to communicate to change understanding. 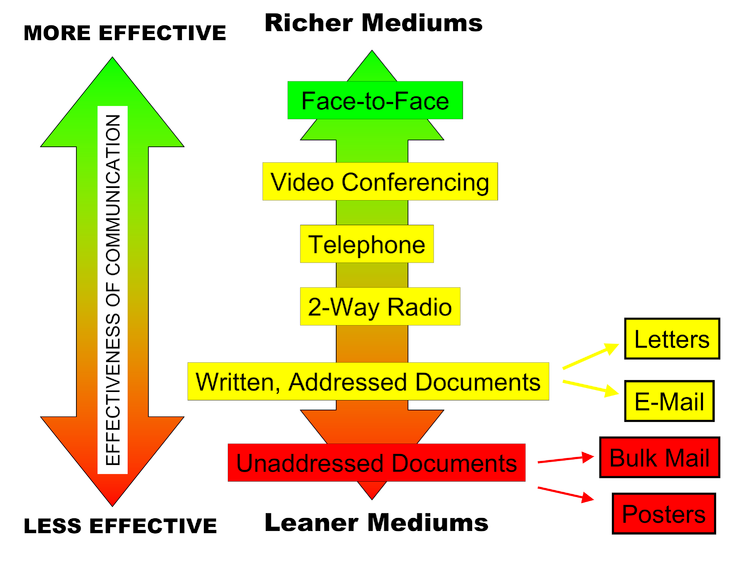 Yet, for me, the telephone fails that test; I say that all oral communication is poorer than depicted below, but only because I distiunguish between understanding and persuasion. Oral media are great for persuading you to change your opinion, but I say that written work is better for straightforward understanding. I agree that oral and visual communication are richer mediums, much as I put above in simpler language. Media richness theory predicts that managers will choose the mode of communication based on aligning the equivocality of the message to the richness of the medium. In other words, communication channels will be selected based on how communicative they are. However, often other factors, such as the resources available to the communicator, come into play. Daft and Lengel's prediction assumes that managers are most concentrated on task efficiency (that is, achieving the communicative goal as efficiently as possible) and does not take into consideration other factors, such as relationship growth and maintenance. Subsequent researchers have pointed out that attitudes towards a medium may not accurately predict a person's likelihood of using that medium over others, as media usage is not always voluntary. If an organization's norms and resources support one medium, it may be difficult for a manager to choose another form to communicate his or her message. Social presence refers to the degree to which a medium permits communicators to experience others as being psychologically present or the degree to which a medium is perceived to convey the actual presence of the communicating participants. Tasks that involve interpersonal skills, such as resolving disagreements or negotiation, demand high social presence, whereas tasks such as exchanging routine information require less social presence. Therefore, face-to-face media like group meetings are more appropriate for performing tasks that require high social presence; media such as email and written letters are more appropriate for tasks that require low social presence. Another model that is related to media richness theory as an alternative, particularly in selecting an appropriate medium, is the social influence model. How we perceive media, in this case to decide where a medium falls on the richness scale, depends on "perceptions of media characteristics that are socially created," reflecting social forces and social norms at play in the current environment and the context that determines the needed use. Each organization is different in the goal that is trying to be reached and the missions that are trying to be completed. Thus, with different organizational cultures and environments, the way each organization perceives a medium is different and as a result, the way each organization uses media and deems media as more or less rich will vary. Communicators also consider how personal a message is when determining the appropriate media for communication. In general, richer mediums are more personal as they include nonverbal and verbal cues, body language, inflection, and gestures that signal a person's reaction to a message. Rich media can promote a closer relationship between a manager and subordinate. The sentiment of the message may also have an influence on the medium chosen. Managers may want to communicate negative messages in person or via a richer media, even if the equivocality of the message is not high, in order to facilitate better relationships with subordinates. On the other hand, sending a negative message over a leaner medium would weaken the immediate blame on the message sender and prevent them from observing the reaction of the receiver. As current business models change, allowing more employees to work outside the office, organizations must rethink the reliance on face-to-face communication. Furthermore, the fear of more lean channels must be rid of. In this current context, managers must decide through trial and error which medium is best used for various situations, namely an employee that works from the office vs. an employee that works outside the office. Business is being conducted on a global scale. In order to save money and cut back on travel time, organizations must adopt new media in order to stay up-to-date with business functions in the modern times. top pic from Google, Alamy stock photo, showing how to stop your ear falling off. I think the human is the ghost of my father-in-law. 1 Thus the mobile phone call that goes to voicemail. The voicemail generally is unclear and says “Call me”. I suggest that at the point where your call goes to voicemail is the point where some other medium is a better choice. What % of your voicemails tell you something different from either <already agreed> of <call me>? That must be your measure of usefulness. To whom is a voicemail useful? I suggest it is the caller, venting frustration, when if the only message is call me, then my phone already has that information. Just occasionally, the caller leaves a message with content, so that whatever the response is, it continues from that information - more than “Call me”. Failure, generally to use the richness of the medium. 2 Productivity is a measure of production divided by hours. Chatter is by definition unproductive. Therefore one might conclude that it is inappropriate to chatter while in employment. There is a need for production-related chatter (talking about the boss’s affair is non-productive, discussing a tech article is work-based and may be productive).